That's Why We Don't Eat Animals uses colorful artwork and lively text to introduce vegetarianism and veganism to early readers (ages six to ten). Written and illustrated by Ruby Roth, the book features an endearing animal cast of pigs, turkeys, cows, quail, turtles, and dolphins. These creatures are shown in both their natural state-rooting around, bonding, nuzzling, cuddling, grooming one another, and charming each other with their family instincts and rituals-and in the terrible conditions of the factory farm. The book also describes the negative effects eating meat has on the environment. A separate section entitled "What Else Can We Do?" suggests ways children can learn more about the vegetarian and vegan lifestyles, such as:"Celebrate Thanksgiving with a vegan feast" or "Buy clothes, shoes, belts, and bags that are not made from leather or other animal skins or fur." This compassionate, informative book offers both an entertaining read and a resource to inspire parents and children to talk about a timely, increasingly important subject. About Ruby Roth (Author, Illustrator) : Ruby Roth is a published illustrator of children's books. 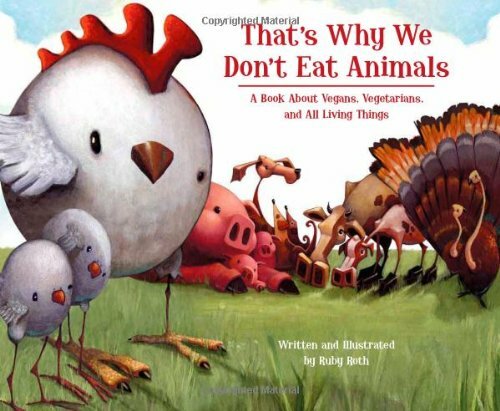 A published credit of Ruby Roth is That's Why We Don't Eat Animals: A Book About Vegans, Vegetarians, and All Living Things.